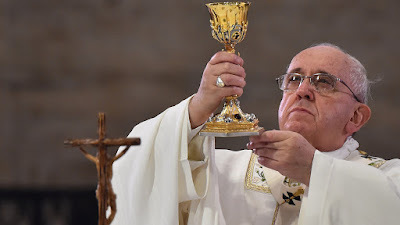 "The wine that is used in the most sacred celebration of the Eucharistic Sacrifice must be natural, from the fruit of the grape, pure and incorrupt, not mixed with other substances. Great care should be taken so that the wine intended for the celebration of the Eucharist is well conserved and has not soured." Like many religious tracts, those paragraphs are open to interpretation. As soon as I read them, I wondered, is the Pope endorsing no-sulfite wine? The first paragraph might read that way, but then the second says the wine should be "well conserved." I don't know how much wine is used for Eucharist celebrations, but the Catholic church celebrates the ritual in every country. From churches alone the demand for no-sulfite wine would be immense. Plus, the papal influence would extend far past sacramental wine. You would expect to see no-sulfite wine on every wine list. In the wine world the Pope would be, dare I say it, bigger than Drake. Here is the fact check: sulfites are not, according to church authorities, what the Pope was talking about in the phrase "not mixed with other substances." "The word that seems to cause the most confusion is 'substances.' The majority of experts and those who write these rules have concluded that this is to mean that wine used for Communion cannot be a mix of several different liquids. A priest cannot mix the wine with grape juice to dilute it, or club soda, or any other sort of liquids or additives which would result in something that was not purely wine. My understanding is that most makers of Sacramental Wine often do add small amounts of sulfites as part of the fermentation process which stabilize and preserve the wine, but that is not objected to since it is part of the process and certainly does not taint the wine or make it something other than wine." "Sulfides [sic] are added in such small amounts that the Holy See has had no objection to them, since their presence does not corrupt the wine." If only the U.S. National Organic Standards Board was as sensible as the Holy See, but it is not, and so "organic wine" in this country cannot contain sulfites. Really, though, we should expect savvy wine guidance from the church, because the Vatican has the highest per-capita wine consumption in the world. At the Vatican, they drink 30% more wine per capita than Italy and nearly six times as much as the United States. "Any good house wine is fine and there are many good wines available in boxes or cubitainers [bag-in-box], these have the advantage of lasting several weeks after opening because air is expelled and spoilage is retarded. Bottom line: the finer quality of wine, the better it is. This is an important consideration since the wine selected will become the Body and Blood of Christ." Sorry, no-sulfite partisans: wines with sulfites are officially "pure and incorrupt." I don't know what His Holiness thinks of native yeast, but if I ever get an audience with him, I'll ask. The Vatican's acceptance of added sulfites in winemaking doesn't surprise me. During my student days at Santa Clara University, Thomas Terry was the Jesuit president of the university who also oversaw the sacramental winemaking at Novitiate Winery in Los Gatos (a town in the Santa Cruz mountains south of Silicon Valley). Terry (a student of Joe Heitz at Fresno State's viticulture & enology program) was also a chemistry professor who well understood the preservative properties of sulfur in winemaking.